The Crazy World of Central Banks. Does anyone wants to bet against the Central Banks? 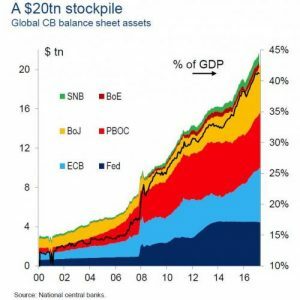 The above chart show that the six Central Banks are now in full control of the global economy and all the markets, financial, commodities, currency etc. These banks own over 40% of the global economy. Given the above statistics and data, does anyone really think that they will allow anyone or any funds whatever to control the various markets and blind-side them??? So, don’t waste studying charts and technical systems to gamble at the global casino. The central banks determine the markets and not market forces. Period!